Click to go to its Flickr page, then click on "All Sizes" to view larger. 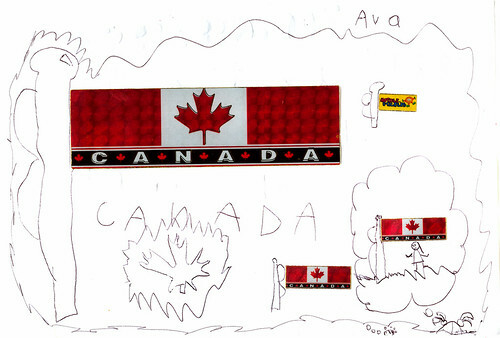 That's what Ava wanted me to call this drawing: "Canada Forever." Could I be raising a potential canuck? Of course you all know that I just got back from Ottawa, Canada, this past Monday, and whenever I come back, I always grab some goodies and what-not for the kiddos. And the kids, they love the stickers. Can't go wrong with the stickers. This is what Ava did with her batch (Ezra put his stickers all over Mommy's face, tee hee! )—she converted her Canadian stickers into flags. At the very bottom there, you can see a tiny girl dreaming of the entire scene. And just above is another girl with pigtails dreaming of Ava standing underneath one of the flags. I swear, I don't know where she comes up with this stuff. She just amazes me daily. Side note: I want to say that I'm thrilled to see that every single one of you whom I met in Ottawa love Ava Thursday. Since the comments have subsided on my blog in general, it's hard for me to know exactly what people are digging or not. So to be able to talk face to face with some of my readers is a big thrill for me and an even bigger thrill to know that Ava Thursday is everybody's favorite! I couldn't wait to tell Ava this once I got home, and when I did, she smiled the biggest smile I've seen. It was beautiful. Thank you all for checking out my talented daughter's artwork on a weekly basis. Both she and I thank you. Got in Atlanta earlier today and boy, was I glad to see my wife's bright shining face right there in the airport! It was a great moment for me. (The shyness bug suddenly hit Ezra and he covered his face with both hands upon seeing me. It was adorable.) I've been up since 4:30am, so I'm not of sound mind and body as of yet. Once my life shifts gears back to normal, I'll have a chance to tell you all the great and wonderful stuff that happened in Ottawa. The festival was a success! And I'm back home safe. Life is good. Tomorrow morning I leave for my yearly trek to Ottawa for the Ottawa International Animation Festival (this is my third year in a row). It's late. I should be packing right now, but instead the warm glow of my Powerbook G4 is calling me. I haven't done any true preparing for the trip; extra pressure from the Primal Powers That Be insisted that I finish all the animation for the next Cocoa Puffs commercial before I leave. This gave me no time for important family time, no time to respond to emails, or blog, or scan, or upload photos on Flickr, etc. Because of the impending trip and late night work benders, it's been insane around here at home, especially since we are still not fully unpacked yet. Yup, you read that right—we're still roughin' it. Getting ready for Ottawa has proven to be frustrating as most of my clothes are still stuffed in garbage bags (easy packing for the move, natch). Last year for Ottawa I was on top of things early on. This year is a much different story. But like Andrea, procrastination is my middle name. I'll prolly rally at the last opportune moment and pull an all-nighter, crashing later during the flight tomorrow morning, for sure. So far, so good. Amid at Cartoon Brew yesterday posted some items of interest at OIAF 06 that I plan on attending. I'm especially curious in hearing Evan of JibJab speak (Brave New World: The Rise of the Independent Creator). I also plan on attending the Concept Design & Art Direction panel that Amid is moderating on Friday. My goal is to see each of the Short Competitions. For the last two years I always somehow managed to miss one out of five screened. 1. Plan on walking. All the venues are pretty much in close proximity to each other, making the town a big part of the festival. 2. Allow time to eat. It's easy to get over-zealous with your schedule, attending every stinkin' screening and event that is available. There's not much time in between, so plan accordingly. You can go all day and not eat one thing. Really. 3. Expect to see some stuff to make you go "Huh?" One thing I can always rely on is Chris Robinson (festival creative director) & Co.'s interest in abstract and experimental animation. Read: some weird ish! But that's why animation festivals are good for you: to take you out of your comfort zone. 4. Go to the Animator's Picnic. Pretty much everyone will attend this shin-dig on Friday. 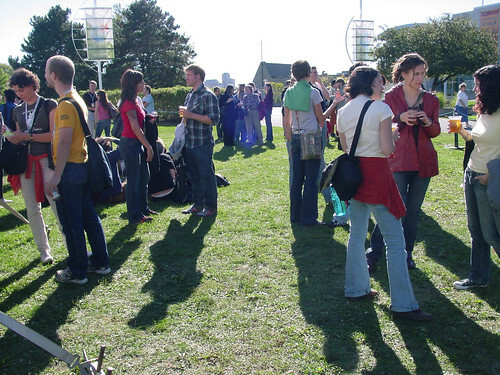 It's a great time to walk around and chat with fellow animators and filmmakers. I saw Bill Plympton walking around with no shoes on in '04. I got to meet Jerry Beck and John Canemaker last year. Excellent elbow-rubbing opportunity. 5. You'll have faith in traditional animation again. Hand-drawn, pencil, ink and collage on paper, scratching on film, paint on cell....you name it, it's being filmed and screened here at Ottawa. Oh sure, there's CG animation represented, but OIAF offers a wealth of films done in traditional methods. Gives you a nice jolt of happiness to see real paint moving without computers present. Anyway, hope to see you guys there! 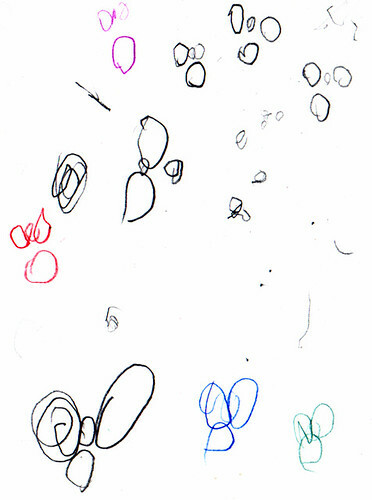 What looks to be a bunch of circles and scribbles, are actually faces—lots of faces—drawn by a very young Ava. She was about two, two and a half, when she drew these faces while visiting me at my work. I remember that she was very particular in the way that she would hold the pencil and draw each and every circle. 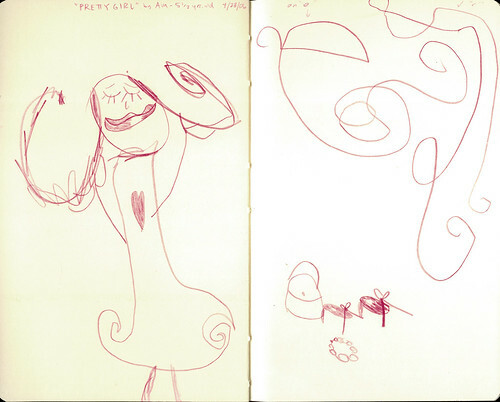 Several months later, Ava showed great progress in drawing faces, and here, she drew Mommy, Daddy, and herself (from L to R). 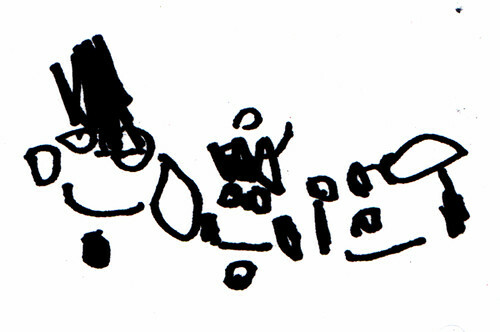 Ava told me that she's crying in this drawing—notated by little lines coming from her eyes. 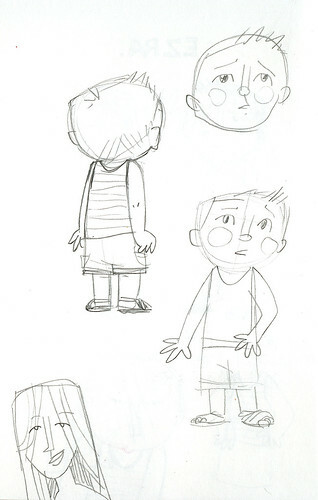 It's so wild to see these drawings and think about when my girl drew them for the first time. She was a pudgy little girl eager to grab a pencil from Daddy's collection and start doodling at the drop of a hat. "Daddy, I draw!" How could I not let her do her thing? Always intense and full of concentration every time she would start drawing, Ava still has that focused energy when she draws to this day. I try my best not to do the little league dad thing and hover over her shoulder, scolding her for not coloring within the lines. 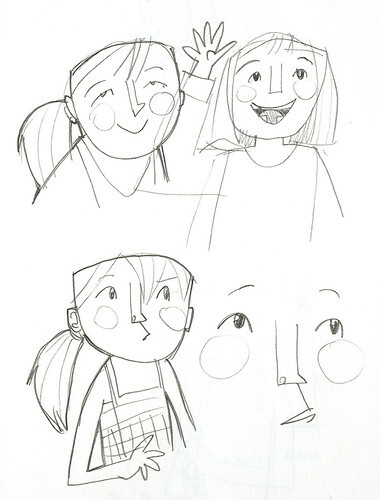 Andrea and I try to give her as much room for artistic and creative development as we possibly can, and when she doesn't feel like drawing or coloring, we back off. It's all about finding the balance. 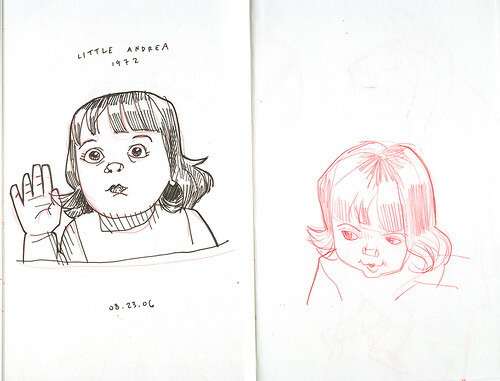 Anyway, I've been meaning to post these early drawings of Ava's for some time now. I just love the way Ava has progressed throughout the years. If you tried to email me via my Comcast email recently and had the email bounce back, try again. There was some confusion with both Andrea's and my accounts that stemmed from the move and now everything has been fixed. Very sorry about that. Enchanted Tiki Room brochure from Matt's collection. Right now, it's a modest collection (still very cool), but hopefully more people will join to share their nifty goodies from the magical park. One thing to realize, if you are not a Flickr member and you have not joined the group, you will not be able to see all the submissions because of several members being NIPSA'd by Flickr. To read more about what NIPSA is, check out Drawn! (read here and here) and this discussion. It's a crazy Flickr issue, so I'm not going to get too far into it. Anyway, check it out! It's Disneyland-tastic. Sometimes I will draw from photos as an exercise. These two adorable photos can be found here and here. This is little Andrea, circa 1972. My lovely wife. She's hot. Trying some ideas out in the way I draw Ava. 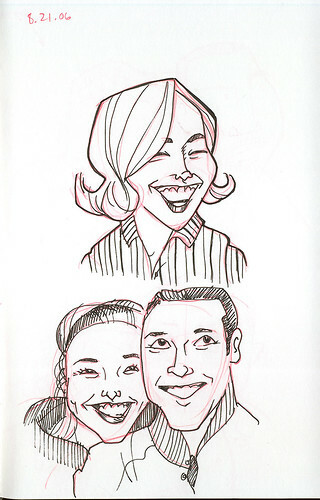 The upper right sketch is based on a photobooth photo of when Ava got in the booth by herself. In case you didn't know, Ezra has The Scowl. It's most impressive. Inspiring, even. Andrea's parents when they were dating. I love these shots! You can check out the original photos here and here. Mind wandering. I like the way the two guys at the top there look. Another guy with a vice! First it was smoking, now drinking. 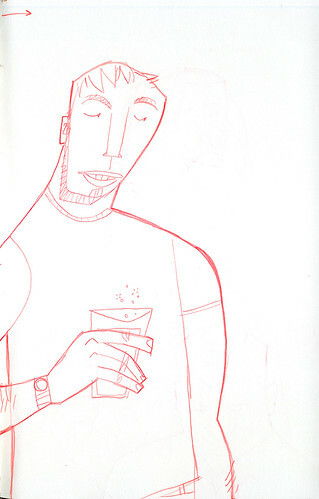 Although I'm pretty sure that it's Coke in his glass there. I think. 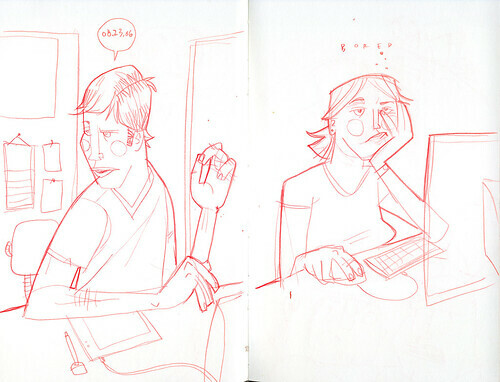 Bored workers. I've never worked in an Office Space environment like this, but I'm pretty sure it's no bag of chips. 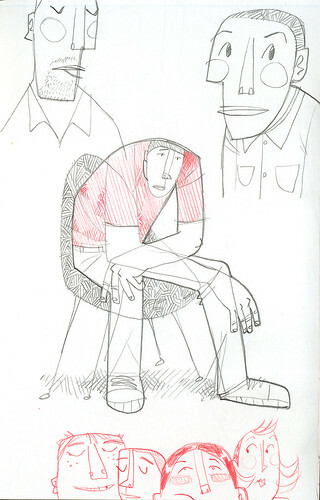 Well, like the ebb and flow of the ocean, I've stopped sketching for now. 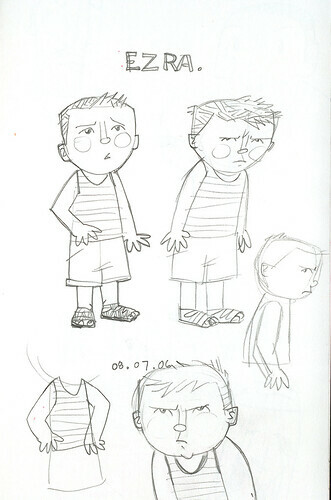 (As you can see these images were culled from last month's drawing frenzy.) The Big Move has squelched all creative energy from me for the time being. But I'm sure it'll be back up and running soon. I hope. FYI: all my artwork, sketches, paintings, images are copyright Ward Jenkins. No stealing, please. I was on my way out the door to go to work when the phone rang. Odd, because it was too early for any phonecalls for our household. It was my sister, Andrea told me, and through her she asked if I knew about what happened to the World Trade Center in New York. I got on the phone to see what she was talking about. "You might want to check it out because it's all over the TV. Some sort of freak accident. A couple of planes hit the towers." I had no clue what she was talking about. Since we had a one year-old at the time, it was typical to have PBS on in the mornings. In fact, I think the Teletubbies was on the screen before I switched it over to NBC. It was then we saw it: both of the towers were engulfed with flames. It was a crazy sight. Just as I turned to that station, the announcer said, "Can we show the playback of what just happened five minutes ago?" And the crazy sight got even crazier: a plane slamming straight into one of the buildings. I remember thinking that you just never see anything like that. To see something like this on television, with millions of people watching, it's just unthinkable. It was a sight that I'll never forget. Andrea's brother, Von, was visiting us at the time. He was hanging out with family before he made the big move to New York City in another week. It was Tuesday morning, and he was going to watch Ava while Andrea took me to work. I stayed a couple more minutes and grabbed a tape to record some of what was happening. Like I mentioned before, it was simply something that you don't see. This was a traumatic event—catastrophic, even—and being the nerdy video hound that I was, I had to record some of it. I remember thinking to myself, "This is our Kennedy assassination." Andrea and I sat in the car in silence as we listened to all that was happening on the radio. One of the stations that we normally listened to was relaying the CNN newscast so we got to hear all the reports that this was definitely an attack on US soil, especially since both of the towers were struck. Not just coincidences. Silence in the car. I was in a daze while I said good-bye to Andrea as she dropped me off at Primal that morning. I was wondering if anyone had heard about the attack at work and when I walked through the door, it indeed was known. By 10am all the studio monitors were on various stations: CBS, NBC, CNN, Fox. I remember that a number of us animators were huddled around CG director Shane McGee's TV when the first tower fell. Whatever station was on had a close-up of the two towers. At one point I noticed some debris falling and then the building in the front began to move slightly. I said, "Look, it's moving!" and immediately the shot changed to a wider angle, revealing the horror. Amidst the expletives and gasps of "oh no's" in the studio, I recall that the on-air announcer was not aware that the tower was falling. He kept rambling on about whatever it was he was talking about without a beat. It was then another announcer interrupted him to let him know what was going on. For a while, there was fear around Atlanta that we could be a target because of the Center for Diseases Control. This was after we heard of the attack on the Pentagon and then later of another hijacked plane. It was crazy with all the fear mongers who began to talk of possibilities and potential targets. None of these theories would prove to be true, but I remember thinking to myself that reporters were beginning to be sloppy with their sources and on-site accounts. But it was an unprecedented event and everyone was going around trying to get as much information they could about what had just happened. Remember the insanity? It was nuts. It was a somber day, needless to say. I couldn't sit still. I would go to my office and sit down and look at the current job I was supposed to be working on and say, "How can I draw stupid Quickdraw McGraw when innocent people are dying?" I didn't get a single drawing done. Nothing like a terrorist attack to put it all into perspective. The day after the attacks, I went outside with Ava in my arms and looked up into the clear blue sky. I distinctly remember thinking that we would never experience this again: a sky free of planes. I sat up late each night throughout the week, watching the reports of the attacks and the footage of the second plane hitting the tower over and over, ad nauseum. In an age of camcorders and video and cameras, I thought surely someone got the first plane, right? And eventually we found out that one French film crew had actually recorded the first plane attack. We would find out that it was recorded by two brothers who were doing a documentary on rookie NYFD firefighters. What an amazing stroke of luck. I felt that as long was we have enough evidence to convict the ones responsible then this was a good thing. But then as Ground Zero became the new buzz word, my heart began to sink further than it already had. It sank for the family members of the ones in the planes who were being forced to watch the deaths of their husbands, wives, mothers, fathers, nieces, nephews, etc....over and over again. And when it became apparent that the firefighters and police officers working at Ground Zero were not going to find many survivors my heart sank even further still. But during the midst of all the sadness, I saw some positive things that I hadn't seen before. People bonding together to work at a common goal: to fix what had been broken. All those workers at Ground Zero were so resilient and dedicated to getting the job done, it was amazing to watch. Now, it's five years later and I still am amazed by all the stories that came out of the attacks of 9/11. Andrea and I just watched the CBS film that the French brothers had put together from their amazing footage while at the North Tower, and it tore open old wounds for me. All the fear, the hurt, the sorrow, the pain, the suffering was brought to the forefront again. And best it should. After five years it's easy to become complacent with all that had happened. Politics make the complacency worse, and then you get all the US government conspiracies diluting the impact of that monumental day. It's all hogwash. Anyone can spin a conspiracy theory with the slightest of footage, documentation, and hearsay and make it seem true. We mustn't lose sight of what happened that day: people died and buildings fell. Families were torn apart and memories were burned forever. It was a day that shouldn't have happened, but did. To all those who died that fateful day five years ago and to their families and loved ones: peace be with you all. To see what is in store for the future of the World Trade Center site, go here. Click on image to view its Flickr page. Then click "All Sizes" to view it larger. 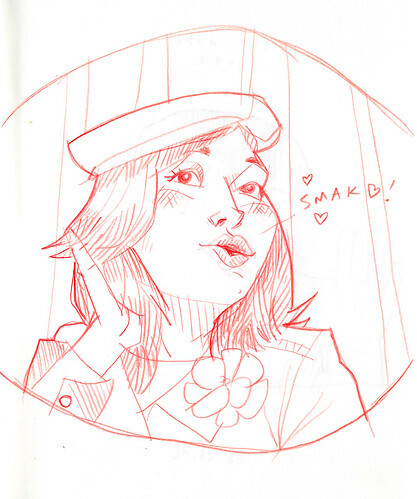 Ava drew this in my Moleskine a few months back after seeing one of my drawings with a girl who had shiny lips. I guess she liked the way I rendered the lips by leaving an area in the middle white to show the shinyness. Ava tells me that the story here is that this is a pretty girl who wants to be a princess but she's not. She says that God made her very special to keep the world safe. "Just like the boss of our world," she says. The squiggle on the right page is mostly a very ornate letter "e." The pretty girl's shoes, purse, and necklace is just under the "e."
Big thanks for all of you who wished us luck on our Big Move. It was crazy, like I mentioned earlier, but we're excited to get settled in—which will take a while, I'm sure. Word to the wise: don't move during Labor Day weekend. 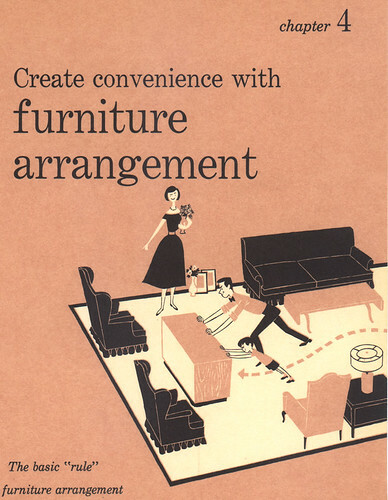 Also: don't move during your wedding anniversary. Something is bound to take precedence and it ain't gonna be marriage-related! (It was our 12th, by the way. Gads, we're so old.) But it was all good, though. We made the most out of a crazy weekend, guaranteeing the opportunity for us to laugh about it years from now. Okay, my fingers are still swollen from moving all the boxes. What's up with that? It was a crazy weekend of moving. I'm so worn out right now, I can hardly type. It's hard to draw with every muscle fiber in my body aching from moving for 4 straight days. And to make it worse, I was summoned for jury duty yesterday, which threw us off track. I want to talk more and show you some photos of the new place, but all in due time. Just wanted to reconnect today. Trying to fit back into my daily routine here.